ETA Jason Stone from Chicago, Illinois. Photo Credit: All photos used in this article were provided by J. Stone. ETA Jason Stone performs the Concert Years. I wish to thank ETA Jason Stone for sending his bio and photos to be posted on SIDEBURNS Magazine. Jason performs his tribute to Elvis in the city of Chicago and surrounding areas where he entertains audiences at popular venues. A talented musician and singer, with a strong background in music, Jason pays a dedicated tribute to the King that has earned him many fans. I have enjoyed communicating with Jason in preparation for this post, and thank him for his kind words, patience, and understanding. 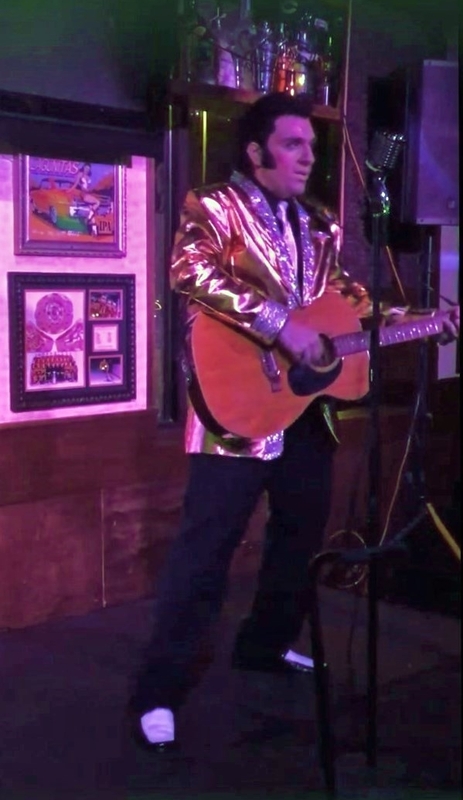 It is always a pleasure to introduce SIDEBURNS readers to fine ETAs, such as Jason Stone, who keep the memory of Elvis alive both on and off the stage by their words and deeds. ETA Jason Stone performs wearing a lei with his jumpsuit in a very appropriate stage setting. Jason was introduced to Elvis Presley at the young age of 3 while watching one of his mom’s favorite Elvis movies, “Viva Las Vegas”. Jason had an instant connection to Elvis and became a lifelong fan from that moment on. Jason comes from a family with a strong musical background, and is a third generation musician. Jason's first instrument, at age 7, was the piano; at age fourteen he began his performance career following in his dad's footsteps as a professional working drummer. After many years of performing in his hometown of Chicago, IL, as a professional drummer and keyboard player, Jason, always a huge Elvis fan, decided in 2013 to pay tribute to his idol Elvis Presley. Jason made his debut in the ETA world in 2014 competing at Portage Indiana's Elvis Fest. ETA Jason Stone with Joe Esposito. In early 2015, he entered The Windy City Elvis Competition where he had the chance to meet Elvis's best-man, road-manger and long-time friend, Mr. Joe Esposito. After performing Elvis's classic song, "Hurt ", Mr. Esposito called Jason over and said he was very impressed with Jason’s performance. Jason was asked to perform at Mr. Esposito's 77th birthday celebration which was held the very next day in Chicago. In that same year, Jason also competed at The Epic Competition in Memphis during Elvis week. In 2015, Jason was also asked to perform at the Legendary Clarion Hotel in Memphis during Elvis week, where Mr. Joe Esposito was also featured on the same day. Today, because of his very active schedule performing his tribute in his hometown of Chicago, IL, Jason does not compete in many competitions, but he always tries to stay in touch with all the ETA fans on social-media, and he shows his support to all the ETA friends he has made along the way. 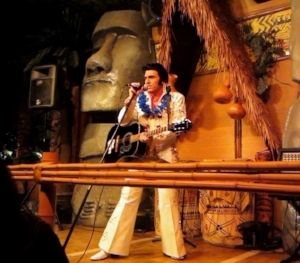 Jason is a well-seasoned musician and performer and his love for Elvis shows in every performance. Jason is truly honored and humbled to be able to perform his tribute to Elvis fans in hopes that he can contribute to the Elvis tribute world by helping to keep the memory of Elvis Presley and his music alive and going strong for generations to come.